We had ALL this knowledge once and made a super little mechanical computer which showed how it all worked, unfortunately its a bit rusty and some bits are missing now. Restoration / back engineering is a work in (slow) progress. The very fact that you could make a mechanical computer which showed the planetary relationships is evidence that it is all “linked” or synchronised in some way. I suggest that for solar systems that do survive (as opposed to those that end up smashing themselves to pieces) there is some kind of mechanism (gravity related) which ensures a degree of stability and non collision. Of course the other non collision explanation possibility may be that there is a repulsive force as well as attractive force. This could be electrical charge. Resonance is an important factor. It’s observed so it’s real. Badger, but how the heck did the ancient folk who made the Antikythera device know so much about the workings of the solar system over cycles of hundreds, if not thousands of years? Let alone figure out how to engineer the mechanism to demonstrate this level of knowledge? As a clockie, I was seriously impressed when I heard about the mechanism, which as I understand it predated the equivalent modern era clockwork complexity by a milennium or more. So much knowledge has been lost…and we think that we know so much. It’s resonance all the way down. For very slow-rotating Mercury and Venus the length of day (LOD) is a big number, whereas for all other major solar system planets it’s far less. Pluto is tidally locked with Charon in a binary system (1:1 rotation and LOD). why does a boat turn sideways to the waves? because it takes less energy to roll than to pitch. this “relationship” is found throughout nature. somehow nature knows how to take the lowest energy path for all interactions. in the case of 2 bodies orbiting in a plane around a third, even though the forces between the bodies may be small, they are not zero. and in a friction-less environment even the smallest force will result in motion. Perhaps there is a small difference in the total forces depending upon whether you are at a resonance point or slightly ahead or behind, and this small difference is sufficient to “lock” the orbits into near resonance. 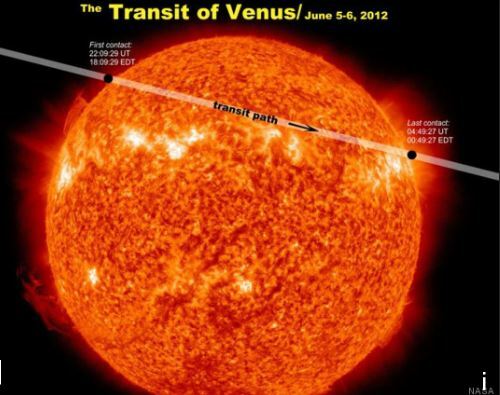 for example: if expect the earth speeds up or slows down slightly in its orbit depending on where Venus is in its orbit, which will change the time that Venus acts upon the earth, as well as changing the Earth’s orbit around the sun. it would not be surprising to find that there are “stable” points almost like lagrange points. call these berple points. for example, there may be a minimum (berple point) each side of the resonance point, with maximums at the resonance point and 180 degrees out of phase. it wouldn’t take much difference in the absence of friction. All of Saturn’s moons create complex wavelike structures within Saturn’s rings, which make them appear finely corrugated. The waves are excited because of orbital resonances between ring particles and moons — at certain distances from Saturn, ring particles and the moons have orbital periods that are integer ratios of each other, so they meet and part and meet again over time, and repeated, rhythmic gravitational tugs by the masses of the moons accumulate to change the orbits of the ring particles. The wavelength of the structures, how quickly they damp out, and other parameters are very subtly responsive to the orbits and masses of the moons. It seems unlikely that planets would be unaffected by such types of forces. There’s the obvious example of ‘orbital periods that are integer ratios of each other’ with 13 Venus orbits = just under 8 Earth orbits. This is an illustration of the horseshoe orbits of Janus and Epimetheus around Saturn. 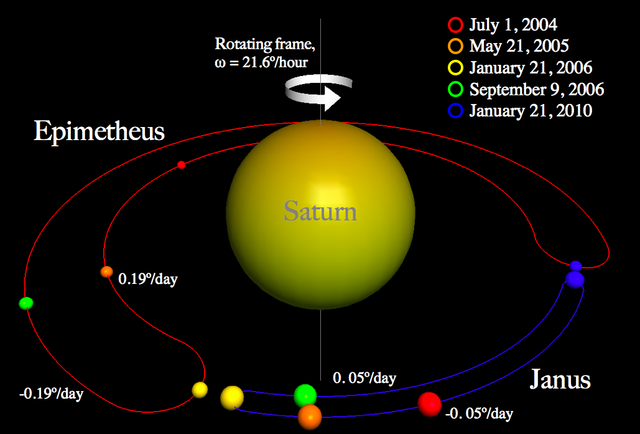 The dates in this image were taken from “The Rotation of Janus and Epimetheus” by Tiscareno et al. published in Icarus, July 6 2009. The size of Saturn is proportional to the average orbital radius, but the distance from the average radius to the inner/outer radii has been exaggerated 500-fold. The sizes of the moons are exaggerated 50-fold. You ask the right question. How did the guys who made the Antikythera computer know both the workings of the planets and have the mechanical/engineering knowledge to create the device. 1. They worked it all out for themselves (like we think we do/did). So you would be correct in that we seem to have lost a lot of knowledge. 2. Somebody else did it for them. 3. Part 1 above and part 2. So for 2 and 3 you need to look for the evidence of “somebody else”. Clearly here we are thinking of an extra terrestrial “interference”. Is there evidence of this? Possibly. We see some ancient pictorial records which seem to show space ship like craft but I have similar pictures in childrens’ books written in the last 50 years which we know are “imagination”. So for me the evidence of ET is there but is relatively weak. To eliminate possibility 1 above we need much stronger evidence of ET. We should really be looking for it but it’s not currently a recognised and respected scientific profession. This means few people do it and those that do are usually poorly qualified. There is a good opportunity here for qualified and knowledgeable experts to change career mid way and become ET hunters.